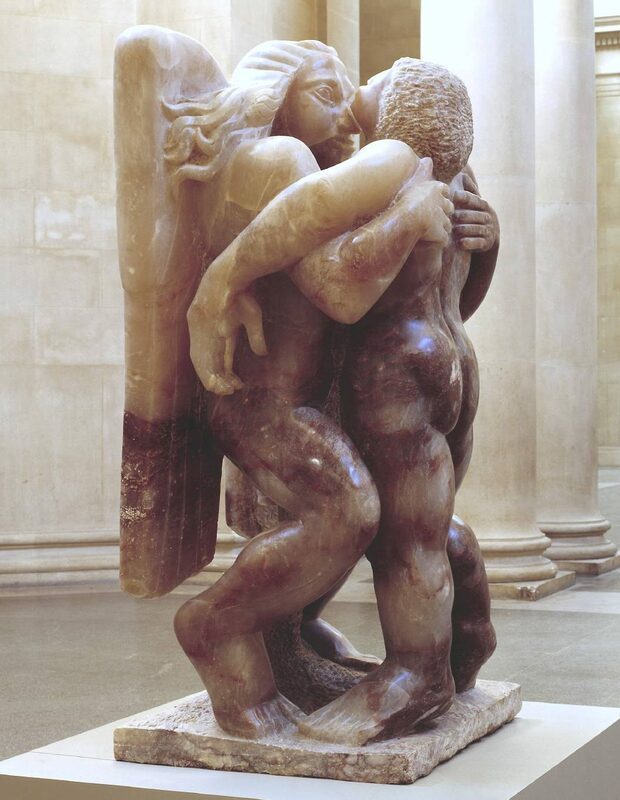 It’s the mass and sheer size of Epstein’s sculpture, currently on display at Tate Britain, that impresses at first. This is not the pale and ethereal heavenly messenger beloved of the pre-Raphaelites, nor the glittery tinsel-clad child of the school nativity. Epstein’s angel, seven foot tall even when crouching, is a muscular and dominating figure who wraps Jacob in his troll-like arms. The whole sculpture, carved from a single piece of alabaster, weighs two and half tonnes. The story depicted here is well known. Jacob, the younger of two brothers, has tricked his father Isaac, and cheated his brother Esau out of his birthright. Esau has sworn vengeance, and the two brothers are estranged. Twenty years after fleeing his brother’s wrath, Jacob learns that Esau is coming to meet him, with an army of four hundred men. His intentions are unclear. Is he coming to reconcile with Jacob? Or to kill him? The night before the reunion that will decide his fate, Jacob is attacked by an unknown assailant. The incident occurs as Jacob is crossing the river, and we are reminded of folk stories and fairy tales in which trolls and ogres guard the river crossing and challenge all who pass by. The two wrestle until dawn, but Jacob, though injured, refuses to let go until he receives the stranger’s blessing. The cryptic and dreamlike quality of the story invites psychological interpretation. Who is the stranger, and what does he represent? Is this Jacob wrestling with his own guilty conscience, as his past misdeeds catch up with him? Does the figure represent the father whom he deceived to attain his blessing? Or the brother whom he cheated and who now comes to take his revenge? Is he a fragment of Jacob’s imagination or subconscious? A demon, an angel, or even God himself? Epstein’s sculpture portrays the fight right at the very end, as dawn approaches. The exhausted Jacob can hardly stand. The angel holds him close, supporting his body and carrying his weight. Jacob looks not so much like a man in a fight, but a tired, emotional toddler after a tantrum, being held and comforted by his parent. In Hebrew, the word ‘wrestle’ is linked etymologically to the word ‘embrace’. They are two sides of the same coin. Epstein’s sculpture captures this ambiguity powerfully. When we wrestle with God, when we struggle with anger and doubt, with pain and suffering, it can feel to us as though God is fighting back, punishing us, deliberately wounding us for our misdeeds and failures. Epstein show us otherwise. In the midst of the fight and struggle, when we are just too tired and too exhausted to carry on, but unwilling to let go, God is not the one fighting us. He is the one who embraces us, in strong arms of love, and helps us to stand.